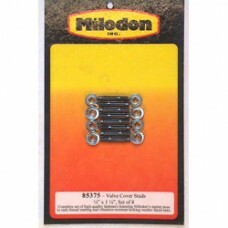 Milodon valve cover studs provide a professional method of attaching the valve covers. Kit includes heat-treated studs with rolled threads and special nuts with built-in serrated washer face. The kit provides easy alignment for quick installation and removal, prolongs gasket life and the serrated washers guard against loosening during operation. 1/4" x 1 1/4" (set of 8) e.g. Small block Chevrolet and Small Block Ford – check your qty required and length before ordering.